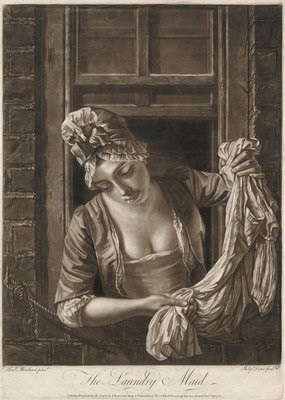 Much responsibility rests on the Laundry-maid. 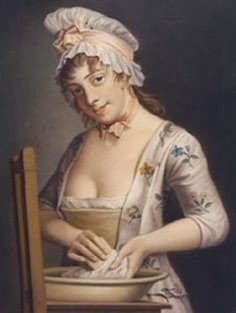 Independently of her having the care of the family linen, &c., in and through the wash, and after it has been ironed, aired, and put away to use, she will probably be required to take charge of the several materials used in washing; such as soap, starch, blue, soda, and a variety of other little things which it is necessary always to have at hand. As it is not unlikely, too, that she may have to purchase such articles, she must not fail to make herself acquainted with their qualities, sorts, and prices, and the most economical modes of managing them. Then, again, she must see that the clothes-baskets, and clothes-lines, props, pegs, and horses, are kept clean and dry, and ready for use. 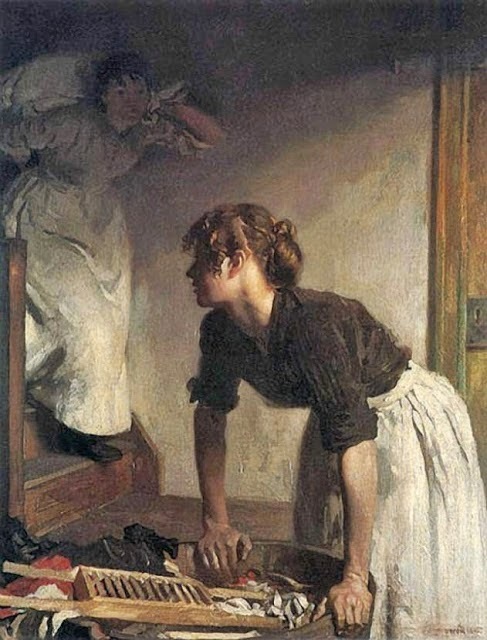 Also that the washing and rinsing-tubs are kept clean—the boiling-coppers clean, and free from verdigris—the irons, of different sorts, all clean, and free from rust—the ironing-board and the ironing-blanket clean, and in a fit state for use—and that all iron utensils, and anything that can produce iron-moulds or other stains, be carefully kept away from the wash-house and laundry. Q. 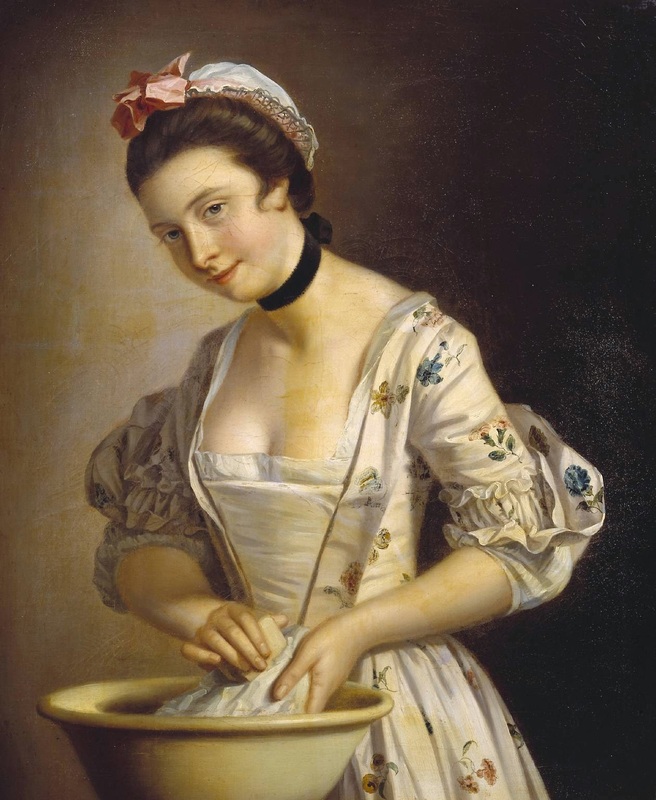 What do you consider to be the objects of your first and constant attention as a Laundry-maid? A. To see that everything about and belonging to the laundry is kept clean, in its proper place, and always ready for use. Q. What do you mean by everything? A. The boiling-coppers, washing and rinsing-tubs; the clothes-baskets, clothes-horses, lines, pegs, and props; also, the flat and box, and Italian-irons, and the ironing board and blanket. A. To prevent the clothes from getting iron-moulded or stained, I must carefully keep iron and copper articles of all sorts out of their way. Q. What do you consider to be the best sort of soap for washing? A. For general purposes, hard yellow soap of the best quality; as it has less alkali in its composition than most other soaps; and as it does not leave an unpleasant smell in the linen. Q. Are not some other soaps occasionally used? A. Yes, ma’am; from its great strength, soft soap is very useful in some cases; and for fine and delicate muslins, laces, and the like, the white or curd soap is desirable. Q. What is the best season for buying or laying in soap? A. It is an advantage to buy it in warm dry weather, and also when it is not in a very new state. A. Because it is much heavier in damp than in dry weather, from the quantity of moisture which it absorbs; and when very new, it is much heavier than when old. Q. Is it not also an advantage to keep it in the house some time before it is used? A. Yes, ma’am; it is economical to do so. Q. Well, what is your method of preparing and keeping soap, so that it may be used to most advantage? A. As soap is always more or less soft when brought home, I lose no time, but immediately out it into pieces of a convenient size for use. A. With a piece of clean fine wire, or a piece of twine —but wire is best—kept for the purpose. A. For the first two or three weeks, I do not leave it open to the air; as, if allowed to dry quickly, it will crack and break when wetted. After a time, I place it on a shelf, with a small space between the pieces, and suffer it to dry gradually. Q. How long should it be kept in this state? A. For some months, if convenient; as, in a dry and hardened state, it rubs away less rapidly in the water. Kept in this manner, a full third of the quantity of the soap is saved in its use. Q. What is the use of soda? A. It softens the water into which it is put, and consequently saves a great deal of soap. Q. What is the best sort of soda? A. Scotch soda is considered the best. Q. How do you prepare it? A. I dissolve a lump, of a size according to the quantity and strength required, in a large jug of water; and I pour the solution into the different tubs and boilers. When the lather becomes weak, I pour in more of the solution. Q. How do you keep your starch? A. It requires nothing more than to be kept in a warm dry room, and it will be good for years. Q. Do you know how to prepare starch for use? A. Yes, ma’am. Taking a quart basin, I put into it a tablespoonful of the best starch. This, having a clean wooden spoon for the purpose, I gradually moisten and rub down with a quarter of a pint of cold spring water, adding only a tablespoonful of the water at a time. When I have got it into a perfectly smooth state, and about the consistence of cream, I gradually stir into it a pint of boiling water. Then I pour the mixture into a clean glazed pipkin, which I keep for the purpose, and stir it over a gentle fire till it boils. A. While in a boiling state, I two or three times turn round in it a piece of wax candle. A. It gives a smooth and glossy surface to the linen after it has been ironed. A. I also put a lump of sugar into it, which prevents the starch from sticking to the hot iron. A. I strain the starch, thus prepared, through a piece of coarse muslin into a clean glazed pan or basin; after which, to prevent a skin forming on the top, I cover the pan or basin with a plate; and then, before it is quite cold, it will be ready for use. Q. How do you keep your clothes-baskets in order? A. I wash them occasionally with warm water and soap; using a scrubbing-brush for the purpose of removing such dust and dirt as may have lodged in the openings of the wicker. After this I rinse them well with cold water, and hang them up to dry in the open air. A. I keep them in a dry room, as, if suffered to get damp, they would become musty; and, before using them, I wipe them with a clean, slightly damped cloth, to remove any dust they may have contracted. A. As soon as they are done with, after the wash, I carefully wipe them, and, if wet, I hang them up in the open air, or at a distance from the fire, to dry. When dry, I put them away in a bag. Before they are used again, I wipe them, that they may not soil or mark the clothes. Q. And your clothes-horses, props, and pegs, how do you keep them? A. I wipe them all, both before and after using; and the pegs I keep in a dry place, and preserved from the dust in a strong linen bag. When necessary, I also wash them. Q. Do you use pins for securing things on the lines? A. Very seldom, ma’am; only now and then, for fine articles, such as muslins, caps, or collars, and they should be used very carefully, as, when the wind is high, the things are very liable to be torn. Q. What do you burn in the copper fires? A. After they are first lighted, either cinders or coke; they are more economical than coal, and they do not produce smoke and blacks to an equal extent. Q. 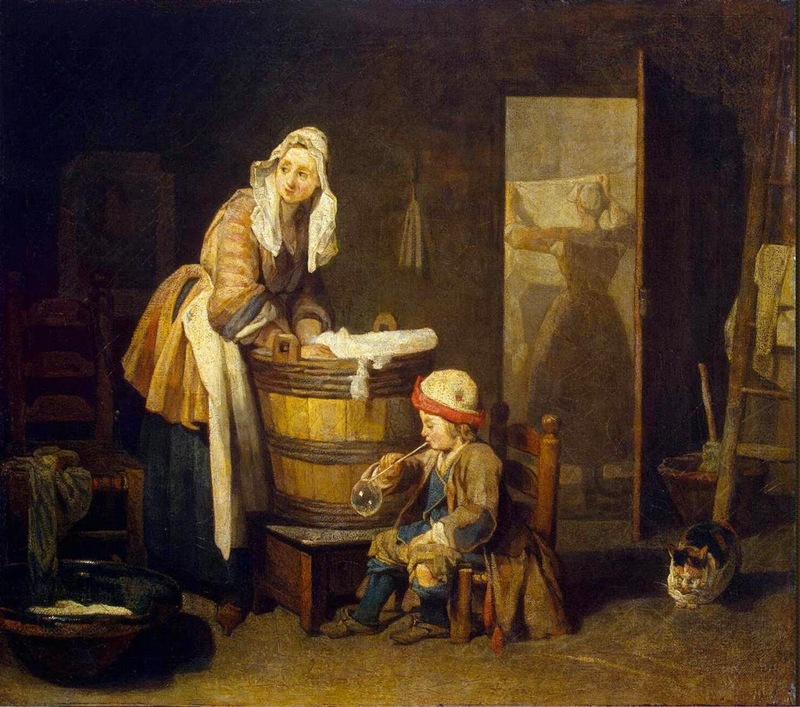 Are you acquainted with the method of collecting all the different articles that require to be washed—the table, bed, and body-linen, dresses, waistcoats and trowsers, stockings and socks, flannels and the like—and sorting them into heaps, so that such and such things may be washed together, or separately? A. Yes, ma’am; I learned that first when I was maid-of-all-work, and afterwards, more fully, when I was house-maid. Q. Well, what is your assortment? A. In one heap, to be kept very particularly by themselves, and to be managed with great care, I put the muslins, nets, laces, and everything that is of a very tender description; and in another heap, to be kept distinctly by themselves, and to be treated very carefully, I put ladies’ Saxony, merinos, and other stuff dresses. Q. Well, what else do you wash separately? 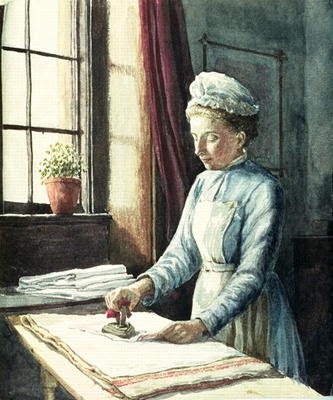 A. Body-linen, fine table-cloths and dinner napkins, sheets and bed-room towels, napkins and toilet-covers, window-curtains and bed-furniture, coloured linen and cotton gowns, gentlemen’s waistcoats, trowsers, cotton drawers, stockings, and Socks, kitchen-towels, cloths, and dusters, fine flannels, and other woollen articles, must all be washed separately. Q. What is there in particular to be attended to respecting stockings and socks? A. Everything else that requires mending should he mended before it is washed; but stockings and socks should not be mended until after they are washed. A. By putting stockings and socks in soak the night before washing-day, there is a considerable saving of time, soap, and labour. Q. What is the best time of the year for washing window-curtains, bed-furniture, counterpanes, blankets, and other heavy things? A. Summer is the best time, because such things will then dry more quickly, and be of a better colour than in the winter. Q. Well, having collected and sorted all the linen, what are your remaining immediate preparations for the wash? A. If possible, I get everything quite ready the day before, that there may be nothing to wait for, or occasion delay in the morning. Thus, having taken care to have plenty of soft water, I first fill the copper, and lay the copper-fire ready for lighting. Q. But if you have not an abundance of soft water, what must you do? A. If I have not a sufficiency of rain or river water, I must use spring water, making it soft with soda, woodashes, or pearl-ashes. Q. But would water so softened answer the purpose for coloured things, or flannels? A. No, ma’am; it would spoil coloured things, and it would thicken and discolour flannels. A. I must secure what little rain or river water I may have, on purpose for them. A. As I always clean them well before I put them away, turn them bottom upwards, and keep a little water on them, to prevent them from running, I have only to wipe them on the insides, to remove any dust that may have lodged. Q. Well, to commence with the white things, shirts, &c.? A. I put them into warm, water—not hot water, as that would mix the dirt in them, and make them of a bad colour. At the same time, I soap such parts as may most require the soap, to be rubbed in, such as the collars and wristbands of shirts, and where there may be most dirt, or appearance of perspiration. A. Then I wash every article twice in plenty of clean warm lather. The next thing I do, is to shake out all the articles carefully, one by one, examining each to see whether it shows any spots or stains. If any of those remain, they must have another rubbing on the part. After this, I put all the things I have washed into the copper to boil, taking care not to crowd them by putting in too many at the same time. That the linen may have a good colour, I throw a small quantity of soap, cut into little bits, into the boiler. A. I wash all the things well out of the boiler, but without taking any more soap; and then I rinse them in plenty of cold spring water, into which I have before squeezed the stone-blue bag. Q. I hope you take care not to be too free with the blue-bag; because, if you make the linen too blue, the colour will be worse than if it had none: it will look as though the blue had been used in excess, merely to hide the dinginess or yellowness, which is occasioned by careless washing? A. Yes, ma’am; I have always been cautioned against that. Q. Is the way you have described, the way in which linen is always washed? A. Some persons wash the things only once, and rinse them twice, after they have been boiled; first in plain water, and then in blued water; but, as I have been taught, the other method is preferable, and I have always found it answer. Q. After the rinsing, what do you do? A. Then I hang the things out to dry. Q. How do you manage ladies’ light muslin dresses, and things of a similar texture and description? A. To do them properly, ma’am, I first let the gather out of the dresses, and take the bodies off from the skin’s. Then, if they happen to have any grease-spots on them, I soap those parts. Afterwards, I wash them successively in two warm clean lathers. A. Then I carefully wring the greater part of the water out of them; afterwards, I shake them well, lay them on a large, soft cloth, or sheet, and roll them up together as tightly as possible, by which means I get out all the remainder of the-water. A. I let them remain in the cloth for a few minutes; then take them out, shake them, and hang them up in the shade till they are nearly dry. Q. And then what do you do? A. I then iron them, while they are yet damp, with a cool iron, on the wrong side. Q. How do you manage dresses made of Saxony cloth, merinos, and other fine woollen stuffs? A. I must have a little fresh ox-gall in the water, which will at once free them from grease, and give freshness and brightness to the colours. Q. How do you use the ox-gall? A. I mix up about a pint of the ox-gall, as fresh as I can get it, in a rather large tub of warm soft water, not hot water, which will be sufficient for two or three dresses. The lather produced by this mixture will be similar to that of soap. Q. But, as the gall is apt to have a disagreeable smell, especially if not very fresh, how do you get rid of that? A. I put salt into the rinsing water, and that will remove the offensive smell of the gall. I rinse the articles twice, shake them out, and hang them up in the shade to dry. Q. Have you got any rain or river water for washing the flannels, and coloured linens, or cottons? Q. What is your method of managing them? A. Having washed the flannels, I rinse them in warm water, and then hang them out without wringing. If not too dirty, the lather in which the flannels have been washed will answer the purpose better than any other for the first washing of the coloured things; and, for their second washing, I take the warm water in which the flannels have been rinsed. A. After washing the coloured things thoroughly, I rinse them twice in plenty of cold spring water, with a little salt in it, and hang them up directly, without wringing. I take them quickly from one water to another, and do not suffer them to lie together before I hang them up, or the colours will be very liable to run. Q. Is that the way they are always treated? A. No, ma’am ; some persons like to have them wrung out and shaken before they are placed on the lines, but I believe the other is the better way, as less likely to affect the colours. Q. But, suppose it is not convenient to hang them up immediately after the second rinsing, then what do you do? A. I must let them remain in the cold water, taking care that it has salt in it. Q. How do you secure the gowns to the clotheslines? A. I peg or pin them up by the shoulders’, not by the skirts, lest the body-linings should get discoloured.